One Stop Mobility offers walking aid rentals to accommodate users with a variety of mobility needs. 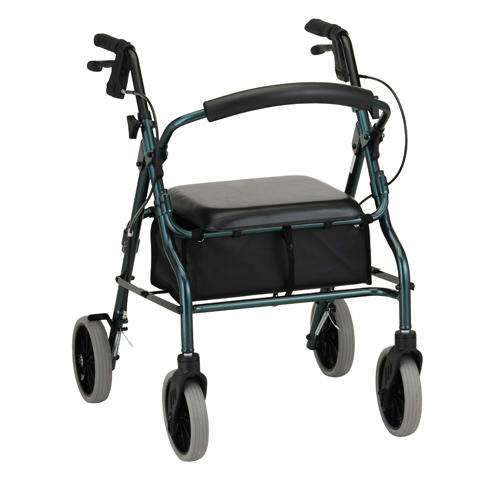 Our rental models are referred to as rollators, which is best described a standard walker with wheels. The handles of the rolling walker typically feature caliper brakes that allow the user to brake each individual wheel. To put the rollator in park mode, typically you will push down on the handle brakes to set it in position before continuing to walk again. Most of the walkers should be able to be folded to fit in a car’s trunk or back seat, allowing you to still live an active lifestyle. Don’t let your physical mobility prevent you from living your normal day-to-day tasks. A rollator allows people with limited strength balance their life. It can offer support and relief on your joints, while still allowing you to stay active and mobile.